Let’s spend a moment deconstructing the word “capitalism.” Note it contains the word Capital. So far so good. Obviously the key concept here is capital. So what is “capital”? It turns out there are multiple kinds of capital. The most familiar kinds are tangible: cash, orchards, factories, water rights, tools, and so on. Then there’s credit. If you have unlimited credit at very low rates of interest, you can buy all the tangible capital you want, as long as it produces enough income to cover the costs of production and the interest you owe on the borrowed money you used to buy the factories, orchards, etc. Some types of capital are intangible but essential to the productive use of tangible capital. You can have the credit, land and pile of lumber needed to build a house, but if you don’t have the knowledge, experience and skills needed to turn the pile of wood into a productive form of tangible capital, you have nothing but an unproductive pile of lumber. If you hire a person with some of these skills, that’s a good start, but you need specialists who can complete all the trades needed to build a fully functional house that can be rented or sold, i.e. earn a return on the capital invested. If the person you hire knows a lot of other trustworthy tradespeople, that’s what we call social capital. The problem with that is most of human life and activity is unprofitable. How about beautifying your neighborhood? Have you noticed that impoverished neighborhoods tend to be ugly and run-down, and wealthy neighborhoods tend to be attractive and well-maintained? Where’s the profit in creating neighborhood beauty? Is Google making billions of dollars from beautifying neighborhoods? How about McDonalds, or Amazon, or Apple or Netflix? If it was really profitable, wouldn’t these global corporations be all over it? It turns out profits only flow from very specific kinds of things and services. The rest of human life has to be done by people who aren’t doing the work to maximize profit, because there is no profit in the work they’re performing. Let’s switch gears and look at credit. As noted above, if you give me $1 billion at .01% annual interest, I am instantly wealthy because I can buy assets yielding 3% and keep the 2.99% I earn for myself. 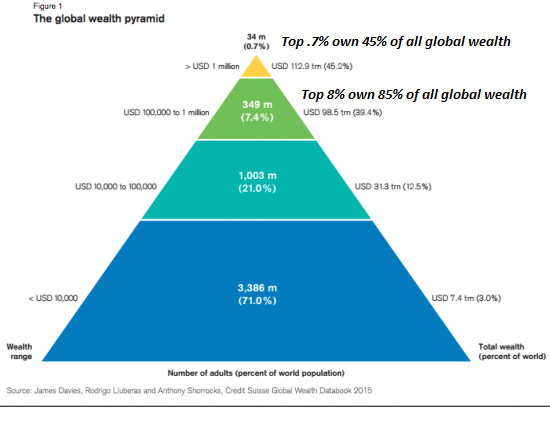 In our credit-cartel-state form of capitalism, money is borrowed into existence at the top of the wealth-power pyramid, in central and private banks. Some modest amount of this new money trickles down the pyramid, but as you can see, not very much trickles down to all the people doing all the work that isn’t profitable, or to all the people without access to the nearly-free-money that’s available to those at the very top of the pyramid. So here’s a new idea: why not create new money at the bottom of the pyramid when people perform useful work in their communities? How about paying people for being producers, rather than paying them to be consumers? How about paying people to do work that isn’t profitable enough for global corporations to churn out robots to perform the work, but that is useful to the community? How about moving the power to create money from the apex of the pyramid down to its lowest level? Impossible, you say? Not at all. We now have a new form of symbolic capital called cryptocurrencies–“money” that can easily be created in the accounts of people doing useful work, as opposed to being created in the accounts of the already-obscenely wealthy, as we do now. Yes, yes, I know all this is “impossible”–but actually, it isn’t at all impossible. We simply choose to maintain the doomed, parasitic, exploitive system we now have that gives capital the power (to create money) to dominate the world.